It is FINALLY FRIDAY!!! The work day today went by so slow it was insane. Like what felt like 2 hours was actually only 20 seconds. So horrible. But now the week is done and we are approaching a 3 day weekend. I plan on spending as much time in the sun tomorrow as possible…so, hopefully it won’t rain until late in the day. Breakfast was Myoplex Shake. Much better today….much colder. Lunch was normal…Morningstar Farms Chicken Patty with lettuce and American cheese, 11 pretzel crisps and 1 chips deluxe rainbow cookie. Also had my Arnold Palmer. Last one that I had at home so good thing it was Friday! 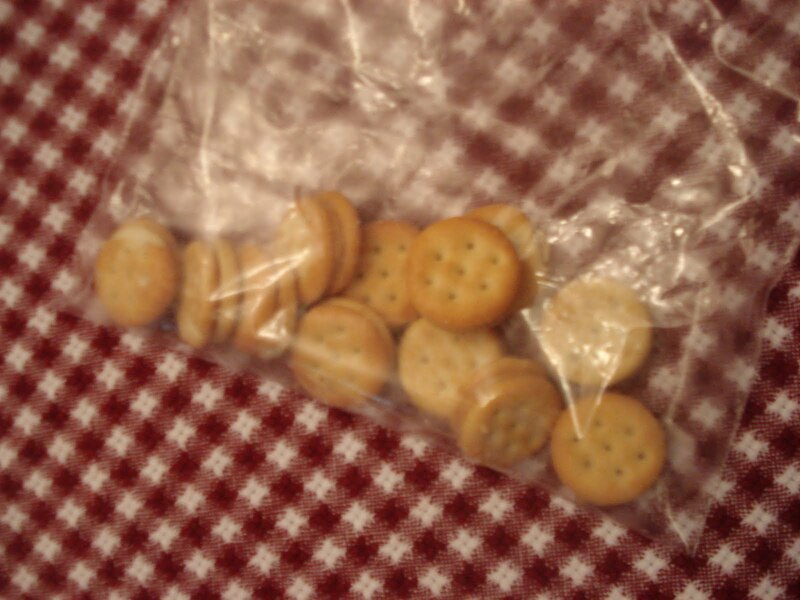 Afternoon snack was a leftover baggie of Ritz Bitz Peanut Butter Sandwiches that I had packed in Taylor’s lunch box. They are so addicting. So crunchy and delish. For dinner, Karen came over and we ordered Outback and Calistoga. Taylor and Karen had Outback, Mommy had Calistoga and I had both. I had a few bites of the Bloomin Onion…amazing as always…especially since we never get one. Also had a house salad from Outback with ranch dressing. And from Calistoga, I got the tomato and mozzarella sandwich and it was not very good. 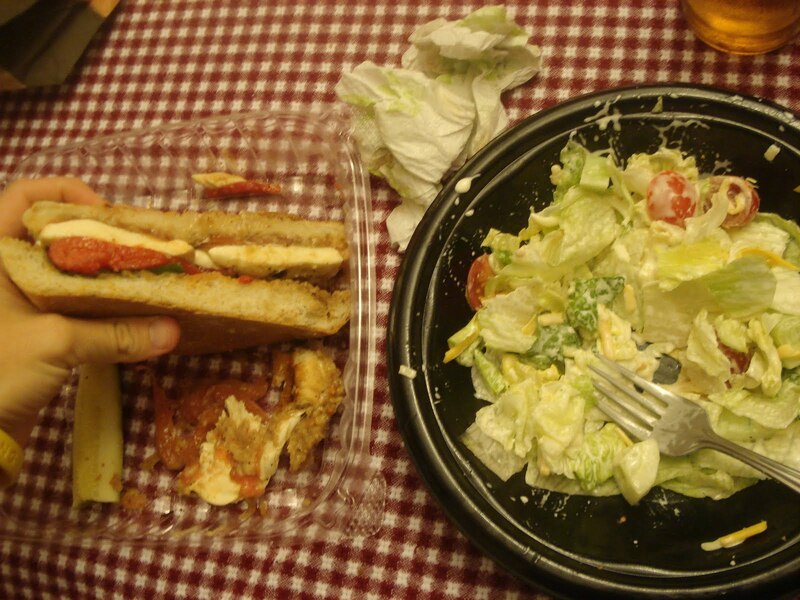 Bread was oversatuated with dressing…ruined the whole sandwich. To drink I had an IBC Cream Soda that I have had in the fridge since summer. Overall the meal was good but I wish I would have just stuck with Outback. 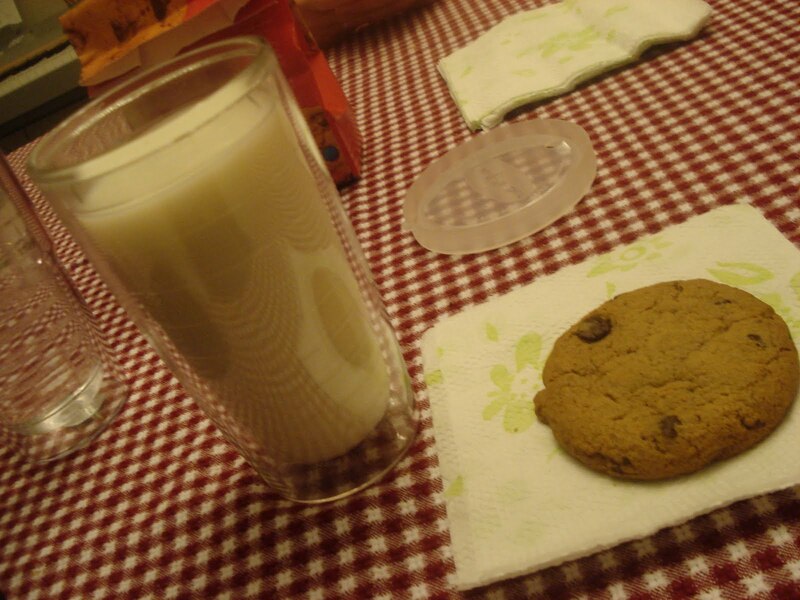 For dessert, I had a chocolate chip cookie from Great American Cookie Co. and a glass of milk. The cookie was so not as good as they used to be. I used to love getting those cookies and the one I had today was nothing great. Was much harder then they used to be and had much less flavor. Now, I am pounding down water like no tomorrow…way too much sodium in that amazing Bloomin Onion. Ready for the weekend and for some S U N! So I am commenting on my own blog. Remember how last week I thought it was the soup at Calistoga that hurt my stomach? Well, it must be the sandwich. I only had the sandwich from there this week and it ATE UP my stomach. I was in so much pain I couldn't even stand up. So Calistoga will be losing my business in the sandwich department forever.